. 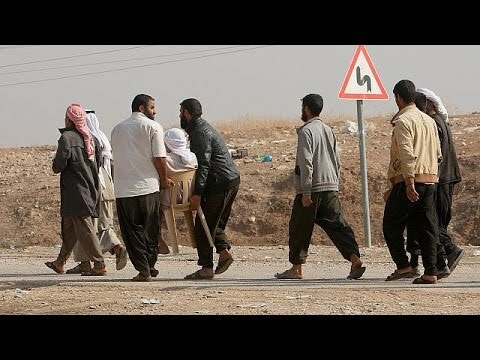 . . “There’s no question that, in the worst case, Mosul will represent the single largest, most complex humanitarian crisis in the world in 2016,” United Nations Humanitarian Coordinator for Iraq Lise Grande said on October 18, hours after an Iraqi-led coalition launched its offensive. There is no telling exactly what the joint force of Iraqi Army and Kurdish Peshmerga troops will encounter in their effort to reclaim IS’s last stronghold in Iraq, an operation that is expected to take weeks or even months. But aid groups, working in cooperation with Baghdad and Kurdish regional government authorities, have prepared for the worst. For UN and relief agencies, not knowing is one of the most difficult things to deal with. “One of the challenges about this is that you can only count on the best information you have at the time so a map is drawn up with a particular scenario and then the next day you have to tear it up and start again,” says Chris Weeks, communications director for the relief organization World Vision International. Mosul, a city that once had a population of 2.5 million, is estimated to house as many as 1.5 million civilians today. All are expected to be affected by the military operation, with as many as many as 200,000 in the first few weeks, according to the UN. But it is difficult to predict when, where, and how quickly residents could flee once troops move in, says Andreas Needham, a Baghdad-based communications officer with the United Nations Refugee Agency. Once people start to leave, they will be first vetted and screened to prevent IS fighters from escaping with them, says Kurdistan regional government Foreign Minister Falah Mustafa. The security of civilians, he notes, is among the top priorities. After the screening process, people will be directed to numerous camps and shelters that have been set up by aid groups outside Mosul. World Vision International’s Weeks voices concerns that the process, which could mean that males as young as 14 may be temporarily separated from their families, will cause further strain on civilians. “Men are going to be separated from their families and that means the remaining families are quite vulnerable, a woman with several children moving to a new area that they don’t know can be quite a threatening environment,” he says. Supplies are believed to be in short supply after two years of IS occupation, winter is on the horizon, and there are serious concerns over the mental and physical condition of residents. To address such problems, the humanitarian community has been collecting contributions and requesting funding for months, and are prepared to provide displaced persons with basic necessities. Zawqari says the ICRC will provide civilians with emergency relief, including food, bottled water, blankets, health kits, kitchen utensils, and other basic items. She says her organization is currently ready to provide emergency aid to 300,000 people. Other aid groups will also be involved in providing emergency help to those escaping Mosul, including the Catholic Relief Service, which according to its country representative Hadi al-Mahdi has recruited about 120 volunteers to deliver emergency aid and even cash. The World Food Program (WFP) has said that it has prepared more than 14,000 tons of family food rations — enough to feed 1 million people for one month — in warehouses near Mosul. In addition, the WFP has also prepared ready-to-eat food rations for 240,000 people. Some 240 tons of medicine will be available at distribution points and medical assistance will be provided by mobile units. Zawqari says the only local hospital in operation, located about 40 kilometers away from Mosul, has been prepped to perform surgeries and treat the wounded among the displaced. For now, Needham says, the UNHCR has set up five camps for up to 45,000 people. He says the UNHCR hopes to soon have a total of 11 camps set up. The camps are expected to have the combined capacity to shelter up to 120,000 people. However, Mahdi says, many of the displaced are expected to prefer to stay in non-camp areas and within communities. To account for this reality his group has devised a new transitional shelter model made from locally available materials. The UN says material for shelter construction will be provided to the displaced to support families who flee Mosul but opt against staying in camps. After two years of harsh IS rule and the stress of their escape, many Mosul residents are expected to require psychological help. Weeks says children are particularly vulnerable. He added that specialized staff have been trained to recognize signs of distress in children, and safe, calming, places have been established at the camps. Of all the bad scenarios, the worst consider the possibility that Mosul residents could be subjected to even greater danger as troops move in. This could mean the mass expulsion of 100,000 people by IS, the extremist group’s use of civilians as human shields to stave off advancing liberators, or, worst of all, a chemical attack, according to Grande. The UN humanitarian coordinator for Iraq says the World Health Organization has first responders ready in case IS uses chemical weapons. “More than 100 people have now received specialized training and that’s a hugely important step in preparing for a worst-case [scenario],” she says.